Searchlights illuminate this nighttime scene at Pad A, Launch Complex 39, Kennedy Space Center, Florida, showing the Apollo 17 (Spacecraft 114/Lunar Module 12/Saturn 512) space vehicle during prelaunch preparations. 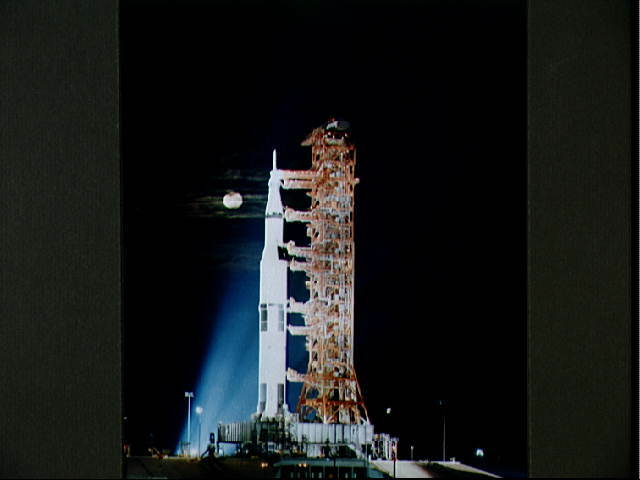 Apollo 17 will be the first nighttime liftoff of the Saturn V launch vehicle. Note the full moon in the background.